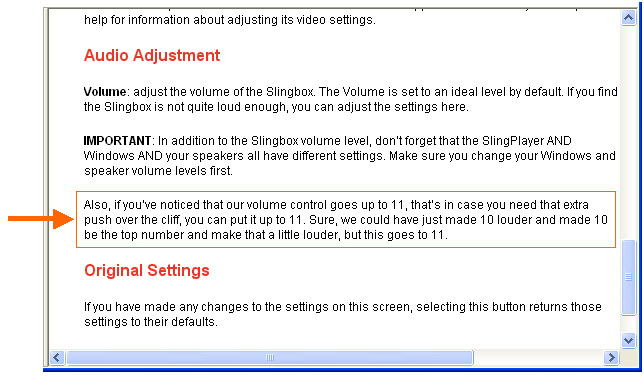 I’ve been seeing great reviews of Slingbox since it came out in the summer. It recently appeared in Time magazine’s best inventions of 2005 issue. And I love how the idea for Slingbox came from Sling Media CEO Blake Krikorian’s frustration about not being able to watch San Francisco Giants games while he was on the road. Funny how so many good ideas are born out of frustration. This weekend I finally broke down and bought one and I have to say, this is a very, very cool product. As soon as you start to use it, you wonder how you were able to get by without it. If you have any need for accessing your TiVo or cable system from anywhere (from work, from a hotel, from the airport, from a different room in your house, etc. ), then you need to go out and get this product. The set-up is quick, it’s not too expensive, and there is no monthly service fee. 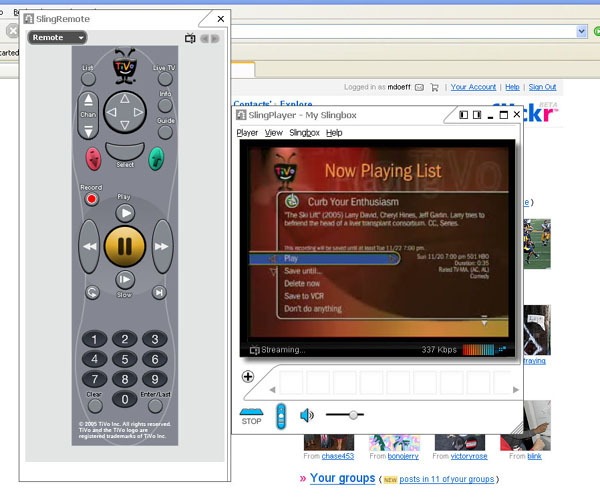 Below is a screenshot showing the TiVo remote and the screen. All of the TiVo remote functions are available – you can watch recorded shows, watch live TV, record new shows, you can even do the hidden TiVo 30-second commercial skip feature. My Slingbox image on Flickr was recently linked from one of my favorite sites – PVRBlog. My submission to Thursday Challenge – Patterns. 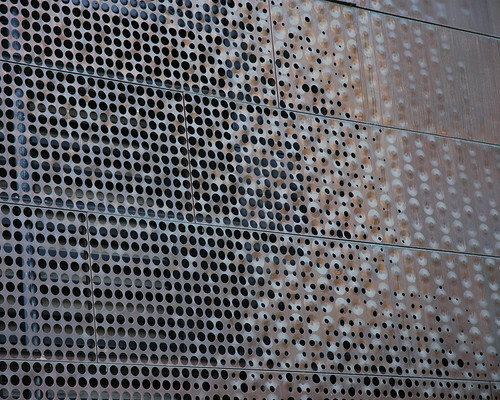 This is a close-up view of the new de Young Museum in San Francisco. I created my first Wayfaring map. Wayfarer is a new service that lets you build a personalized Google map without requiring any programming. 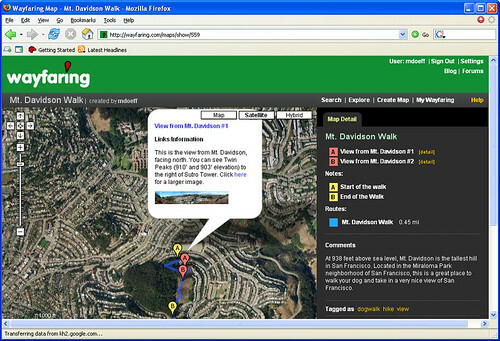 You can annotate the map with a route, add notes, tags & photos to your map, and share the map with friends. The sunsets have been pretty amazing in the SF Bay Area the past couple of days, especially the sunset on Sunday the 13th. Unfortunately, I did not have my camera with me but I was able to find some good shots on Flickr. As far as I can tell, these are all shots of the same sunset, taken by different people from various locations around the Bay Area. Check out the Flickr blog for a similar sunset “collage” from 1/29/2006.